Boy’s A Middle School With Their First Win of the Season! 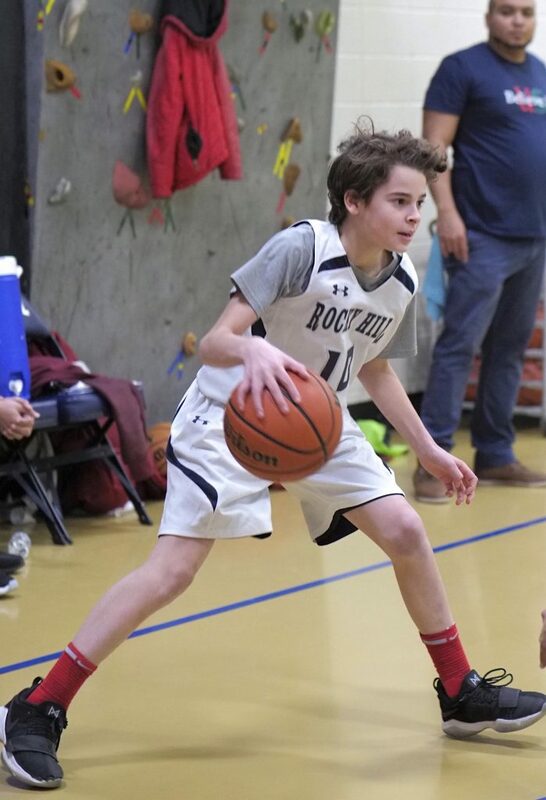 The Rocky Hill boys middle school basketball A-Team hosted St. Michaels on Monday, January 28 2019. The boys scored first but St. Michaels battled back. Our boys ran a press for the first half and held St. Michaels to 13 points to our seven. At halftime we decided to change the game plan. We chose to run a box and one on their best player and abandon our press. This change proved to be a benefit and the boys battled back. The boys scored 21 points in the second and held St. Michaels to just twelve. The game came down to the wire. St. Michaels had the lead and ball with under a minute left. The boys never gave up and were able to take the lead in the final seconds of the game. Hadley Martinez had six points from the field and two points from the foul line. Derek Block had six points as well and a crucial shot from the free throw line. Alex Lehouiller had two steals, two rebounds and two clutch points from the free throw line. Colin Zito had two points and played great defense on their best playing while running the box and one. Brennan Hill had eight points and a completed foul shot as well. The boys won their first game of the season and are now 1-2 overall. The final score was 28-25. Next week, the boys will travel to Pine Point!